Plans for Summer 2004 programs have not yet been announced. All camps 8:30 a.m. to 3:00 p.m. Your ticket to the wonder and excitement of the Sonoran Desert! What do kids do at Museum Explorers? They have fun! 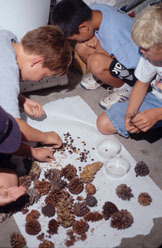 Hands-on learning is at the heart of this discovery program. Kids get "into" the desert with their hands, body, and mind. All age levels will experience interactive class activities with museum artifacts and sessions with live animals, guided tours and hikes, arts and crafts, songs and games, and science projects using cool equipment like microscopes, light meters, and sling psychcrometers. Come discover the secrets of many of the incredible mammals, birds, reptiles, amphibians, insects and plants that share the Sonoran Desert with us. Delve into geology, pollination, predator-prey relationships, and get a "behind the scenes" look at Desert Museum exhibits.